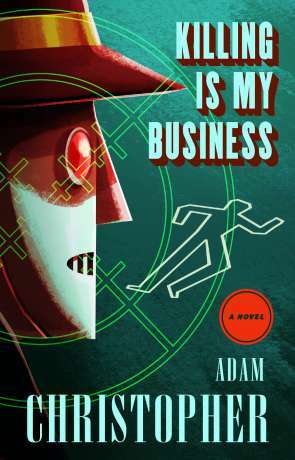 Killing is my Business (not to be confused with Megadeth's debut album) is the second novel in Adam Christopher's LA Trilogy, following on from Made to Kill. Featuring the robot Assassin Raymond Electromatic, disguised as LA's only artificial private investigator. it's a unique blend of hardboiled detective Noir and science fiction that has a distincive 1950's / 19060's aesthetic. Imagine raymond chandler writing an "Amazing Science" story. Our robot killer has a computer the size of a room called Ada, who provides Raymond's assignments and otherwise helps him out. Given that this is 1960's technology, Raymond has his limitations. A recharge of batteries every night along with a wipe of his memory tape is needed. This adds a unique slant to the story, every day he's got a fresh slate and requires a morning catchup with Ada before beginning the day. It also provides some limitations on how far Raymond can travel and how late he can stay out. This time Raymond finds himself saving the life of Mafia boss Zeus Falzarano so he can kill him at the right time. Of course things are never that simple and there is a certain amount of investigation required. The author has really nailed it with this book, the voice and pitch are spot on, the plot inventive and there simply isn't any wasted space. I love the way the author paints Ray as a killer who has to do some investigating to complete his contract, often incidentally helping others. It's more than that though. Ray's been programmed to be a killer but his natural instinct is still a detective and he can't help but fall into this role. The story has some great twists and turns, builds up the suspense as it goes and has a big reveal at the end, which while I did see coming, ended the book perfectly. I've been reading Adam Christophers' books since Empire State and you can see his voice mature with each new novel. Killing is my Business is his finest novel yet. It's a stylish novel that closely follows Noir convention while having a lot of fun doing so. Clever and entertaining from beginning to end. Written on 13th October 2017 by Ant.